All indoors. So whatever the weather. Ideal training facilities for individuals, groups and clubs. The arena surface is renown for being of a springy low impact nature which is kind to your horse or pony's feet and legs and reduces fatigue. The jumps are maintained to a high standard, with many different fillers providing variety so increasing your horse or pony's education and experience. 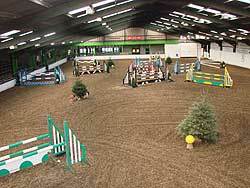 The courses are built and designed to British Showjumping specifications.. The large indoor has 60m x 30m of arena space with a seating gallery for 350 along with a ringside restaurant and bar. 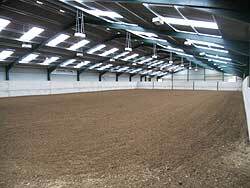 New indoor arena is 45m x 25m. Special rates for Pony Club, Riding Clubs and Trainers which will include Tea & Coffee FOC.